The Louisiana Civil Service League is a statewide non-profit educational organization founded in 1940 dedicated to the extension, preservation, and improvement of Merit Systems of public employment in Louisiana. The main purpose of the Louisiana Civil Service League is to conduct educational activities throughout the state, to explain to citizens the meaning, effect, and advantages of the state and city civil service laws. This educational program emphasizes and explains that these laws keep political duress out of the workplace and guarantee protection of employees from discharge or disciplinary action for not campaigning for or supporting an elected or appointed boss. This program also apprises citizens of the civil service laws which guarantee their right to a fair and equal opportunity for public service. The League’s Executive Vice President advises city and parochial jurisdictions on personnel matters and helps to establish merit civil service laws tailored for their use. He also interprets existing laws for other political entities. Semi-annual educational seminars are also arranged by the League to inform personnel professionals from jurisdictions from throughout the state. The League sponsors an annual Dunbar Awards Program that honors outstanding civil service employees nominated by their appointed authorities. It is now in its 52nd year. The Monte M. Lemann Awards honors those not in the classified service. After signing of Civil Service Constitutional Amendment (1952). 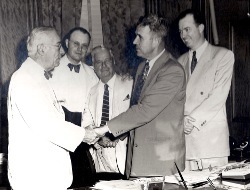 In 1940 the Louisiana Civil Service League was instrumental in the establishment of merit systems of public employment for Louisiana and New Orleans. After abolition of the system in 1948, the League was successful in having the system re-established in 1952 and placed in the state constitution with strong prohibitions against political activities by state and city civil service employees. It also helped avert many attacks at the Constitutional Convention in 1973 to emasculate these constitutionally protected civil service systems. Since that time the League has been successful in blocking attempts by the legislature to weaken these systems. Twenty-three municipal and parochial merit civil service systems have been established in Louisiana with the League’s guidance. These systems help ensure that public employees are hired because of qualifications and not for political reasons. They also ensure that employees who do not perform are terminated. The Louisiana Civil Service League is supported entirely by the membership contributions of public spirited individuals and companies and foundations in our state. No civil service employees are allowed to contribute to the League, and 100% of the budget is derived from these annual memberships. One of the League’s main goals is to preserve and improve the Merit Systems it has established because attacks are constantly made by elected officials and special interest groups who would like to have control of public employees. This goal is in addition to establishing new systems in parishes and cities when necessary and the political climate is right for their creation. A longtime goal is to include other exempted groups such as Sheriffs Deputies, Clerks of Court, and Assessors employees under political activities protection. Seventy percent of each tax dollar in Louisiana is used for public payrolls. The taxpayers of our state, not the elected officials, are the employers of these employees. The League helps ensure that these payroll dollars are administered fairly and equally with opportunity for advancement in pay based on merit, as skills increase and as the cost of living rises. Contributions to the League are tax deductible under section 501(C)3 of the Internal Revenue Code. The League can accept appreciated equities.